Hoshizaki B-500PF Top-Hinged Ice Storage Bin, 30 W, 500 lb. Home / Restaurant Equipment / Commercial Ice Machines / Ice Machine Bins / Hoshizaki B-500PF Top-Hinged Ice Storage Bin, 30" W, 500 lb. 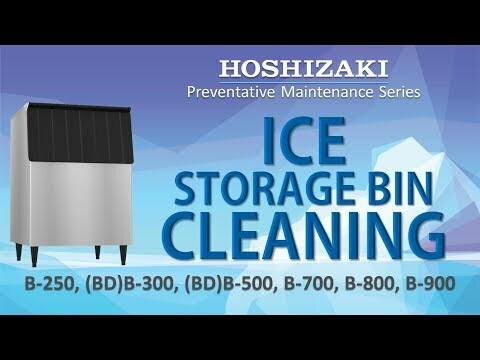 Easily store and access your ice in the Hoshizaki B-500PF Top-Hinged Ice Storage Bin. This unit has a 500 pound storage capacity and is protected by H-Guard Plus Antimicrobial Agent. With a resilient vinyl clad exterior, this bin features a polyethylene bin liner for sanitary storage and sturdy construction for side-by-side or stacked ice machine installation. Measures at 46 inches tall by 30 inches wide by 32.3 inches deep. ETL, ETL-Sanitation.